This Great Planes Super Sportster 40 was my first foray back into aerobatic radio control airplanes after about a 12-year hiatus whilst completing an electrical engineering degree and starting a family. A Super Tigre .46 provided ample power, but I do remember that on the first flight, the muffler came off in flight and I never found it. The picture below was taken about a mile from our house, where there was a long, straight section of country road that was perfect for taking off and landing. 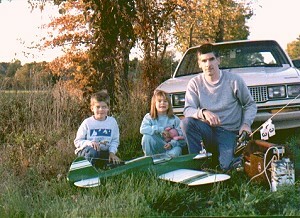 It was possible to fly the Carl Goldberg Freedom 20 from the back yard, but this airplane was too hot for that. Philip and Sally are about six or seven years old in this picture. We had moved to Smithsburg, Maryland, from Utica, NY. A year prior to that we were living in Burlington, Vermont, which is where that gallon fuel can came from - it originally contained Vermont maple syrup. As with just about all of my radio control systems, this one was made by Futaba. Quite a few flights were put on the Super Sportster 40 prior to selling it. We were about to move on to Waseca, Minnesota, where I had been offered an engineering job. I figured it would be best to sell this one here and build an new one there. That never happened. It was not until after leaving Minnesota to move to Colorado Springs, CO, that I had the opportunity to fly a radio control model again. 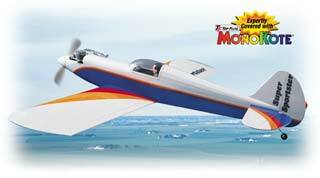 Great Planes no longer sells a kit for the Super Sportster 40, but it does sell an ARF version of it.